Hello everyone! 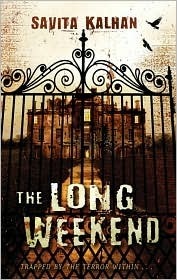 Today I'm happy to welcome Savita Kalhan, author of The Long Weekend, to my blog! Let's find out a little about this lovely lady shall we? 1. Hello and welcome Savita! Thanks for stopping by. I always like to start my interviews with a challenge. If you had to choose a color to describe you, what would it be and why? Hi Jessica, thanks for having me here today! That is a challenge! I’ve never thought of myself as a colour. I have favourite colours – I love green, pink, purple, orange, red, black, but I think I would have to go with green. Don’t ask me why because I don’t know. 2. I read in your author bio that you traveled extensively. What would you say was your favorite place that you visited? I think my favourite place would have to Malaysia. I’ve been to Malaysia twice – once on my honeymoon and again several years later when I was pregnant, although I didn’t know I was when we went! Each time I loved it, and it has great memories for me. I love it for its warmth, its tropical feel, the sandy beaches, the view of a glittering turquoise sea to wake up to, food that puts a smile on your face, a multi-racial culture that’s rich and diverse, and teeming with stories and legends. 3. Teaching English is what really sparked your interest in writing, correct? When would you say you had that moment of clarity that it was something you really wanted to pursue? When I was a kid I wanted to be a teacher, librarian, or bookshop owner. I never for a minute thought I would ever be able to become a writer. It was like wishing to be an astronaut or a princess! But I always loved reading and always wondered what it would be like to be a writer. When I was living abroad and teaching English, I was very removed from any environment I had previously known. I think it gave me a bit more courage to try my hand at something that I hadn’t even allowed myself to dream about before. So I think the interest has always been there, but the courage hasn’t. 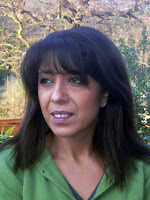 By the time my son was ready for full-time school I had been writing on and off for a few years, and we were back living in England, I think is when I knew I wanted to pursue being a writer rather than going back into teaching. There are always times when you wonder if you made the right choice, but if I had stopped then I would never have gone on to write The Long Weekend. 4. Is there a place that you go for inspiration while you write? My back garden backs onto a brook and some woods, and I love walking in there or just sitting out on my deck and gazing at them, letting my mind drift wherever it wants. It’s relaxing and empties my head of non-essential stuff and allows the story I’m working on to meander through. Don’t laugh, but the other place is the gym! It’s somewhere else where I can let my mind switch off. I’ve got my earphones in, my body is busy on the treadmill or the cross-trainer, and my head switches into a different gear, which allows the story to filter around and percolate. 5. What is one food item that you cannot live without? That would have to be dark chocolate, but especially the dark chocolate cherries in cerise! Divine! But if you’re talking about proper food, although I’m sure you’re not, I would have to say the boring old, but extremely versatile potato, whether it’s chipped, mashed, sautéed, or baked, I love ‘em. 6. Is The Long Weekend your first writing project, or did you have others before this thriller gripped you? The first thing I wrote was an epic fantasy trilogy – talk about throwing myself in the deep end! It started as a fun thing with a friend – we were living in the Middle East and it wasn’t easy to get hold of books. I would come back from a holiday to the UK with my suitcase stuffed full of them. We were really into fantasy epics at the time, but some of them weren’t that great and after the effort it took to bring them back it was so disappointing. So we decided we would write one. I wrote the first chapter, and my friend was supposed to write the second. She loved the first chapter and said I should carry on and do the next one and she would write the one after that. Well, I got to the end of the second book and my friend still hadn’t written a word of it, but she read and critiqued every word! I also wrote a series of picture books with characters based on extinct or endangered animals, and then another series for middle-grade readers about an Eagle boy. I haven’t looked at any of them in a long time, so maybe I’ll try and get around to it one day. But I think it was good to keep writing and trying out different styles and voices. The Long Weekend came to me like a bolt from the blue – it was so different to anything else I had ever written and yet so right for me. 7. Thank you so much Savita! Last question. Is there any advice you have for aspiring writers out there? I would very strongly urge any aspiring writers to read as much as they can, read everything they can lay their hands on. To find out as much as they can about the publishing industry, to network with other writers, published and unpublished, and they’re lucky now to have so many wonderful groups and organisations that they can find with a click of a few buttons on the internet. Being internet savvy is important, as is blogging, and joining other social networking sites. Lastly, and probably as important is to keep reading, is to keep writing. Never stop, ever.